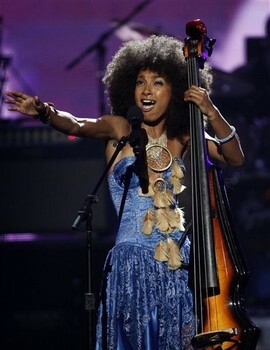 Last Sunday June 27th, Esperanza Spalding performed as a featured artist at the 10th annual BET Music Awards hosted by Queen Latifah. Esperanza paid tribute to Prince who received a lifetime achievement award. Esperanza performed "If I was your Girlfriend" and also sang with Janelle Monae, Patti LaBelle and Alicia Keys.